This is part 9 of a 31-part posting of my journal entries and photos from one of the greatest experiences of my life so far--a month-long mountain climbing trip to the Atacama Desert area of northern Chile and Argentina, which included summiting three 6000 meter peaks (~20,000 feet). To view all the entries in this series, check the posts labeled South America. I started this morning at 15,600 feet elevation and was back at the Pacific Ocean, English Bay, by mid-afternoon. 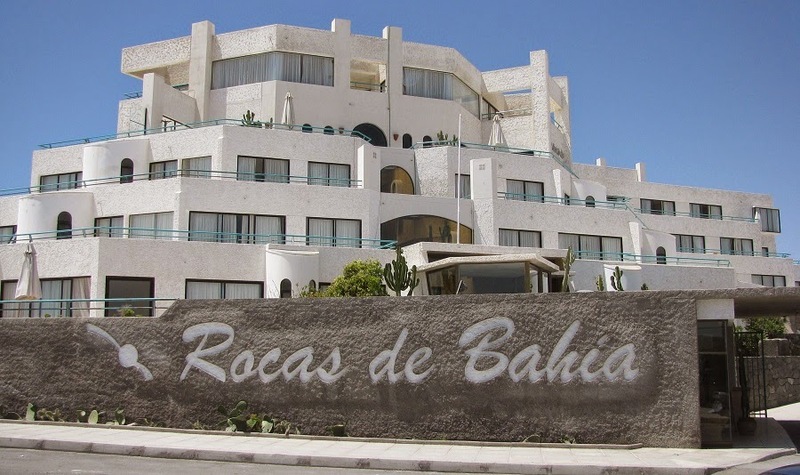 to spend one last night at the sea-side Rocas de Bahia hotel. I got up and went outside just to stretch at 11:45 then began to get a bit of decent sleep. I woke up at about 4AM and began to watch the eastern sky. Amazingly, with the sun still 30 degrees below the horizon, there was detectable glow beginning--noticed by comparing with the horizon in other directions. I continued to watch and relax, waiting to see the final moon rise of this cycle, with the new moon tomorrow. The sliver moon finally rose at 6:07. I turned on the car to start it warming up and then did a few chores and rearranging the mess in the car. I left my 'campsite' of the last three nights at 6:37AM and started heading back to Copiapó. It was 1.1 km just to get from my parking area to the highway at the pass--round trip of a mile and a half avoided with each hike! The sun rose on the high peaks at 6:50. 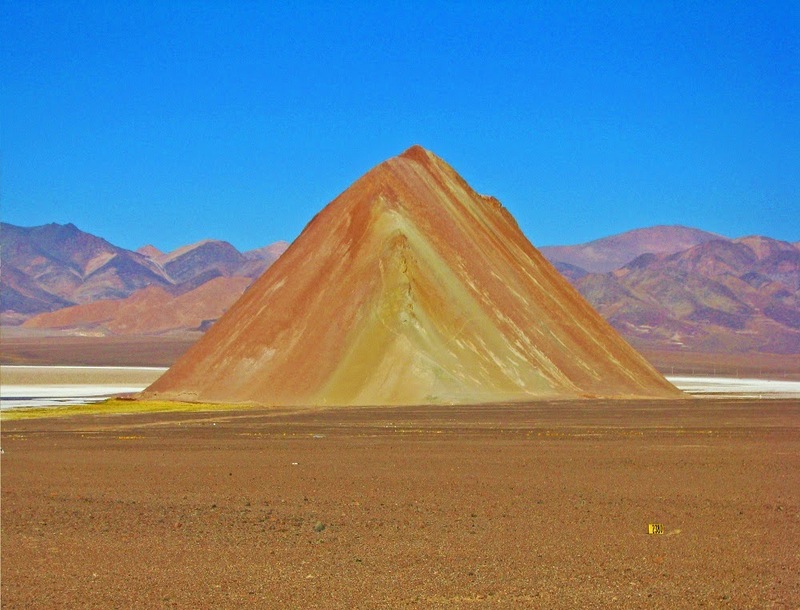 The drive was uneventful and I only took one short pause at a salt flat near the border check point to photograph this cute pyramid mountain sticking up out of a salt flat in the middle of nowhere. 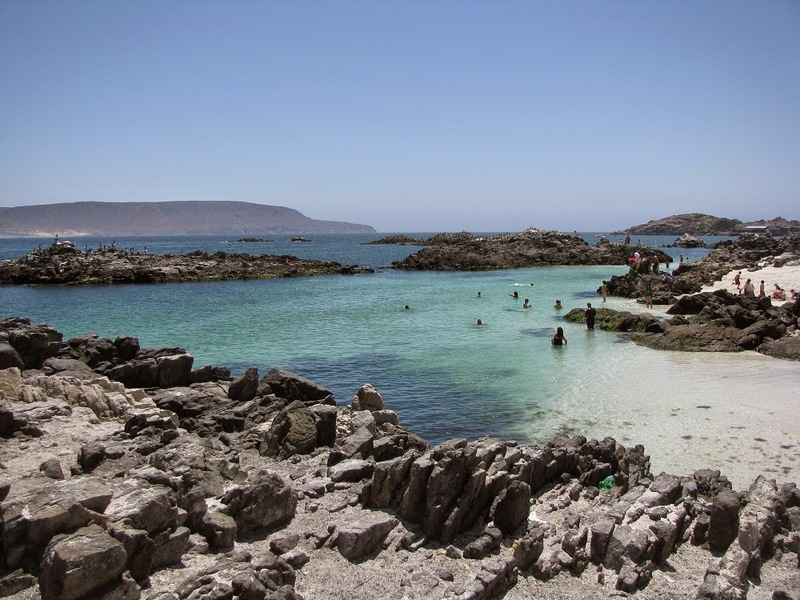 I arrived in Copiapó at about 11:20 with the gas gauge still touching the half-full mark. So the trip down took well under 3/8 of a tank! In my angst about having enough gas, I didn’t consider that it would take much less gas to descend 15,000 feet than it would to ascend. I bought gas as I was making the turns necessary to get to the Jumbo store--bought only 10 liters, which will be more than enough to get me to the airport with much more gas than it had when I picked up the car. I then shopped at the Jumbo store at 11:45AM. It’s a general store, not just a grocery store, so although the food selection was great, it’s not comparable in size to things in the US. The relative amount of space devoted to fresh foods and non-prepared stuff was huge compared to in the US. I bought most of what I needed plus two beers to add to my Chile beer bottle collection. They didn’t have anything good to buy as souvenirs. I then hit the road, passed through Copiapó, and stopped at a big new modern interchange south of the city, where I parked on a side road off the frontage road and drank the beers while they were still cold. The much cheaper one, a black lager, was better. The other seemed more of a collector’s item, much more expensive, and brewed in Punta Arenas, as far south as you can get before hitting Antarctica. 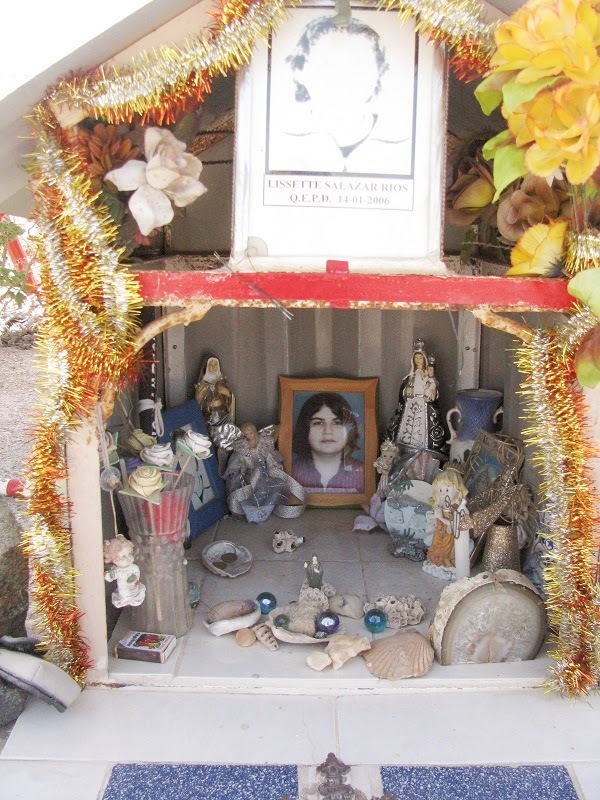 I then headed on down to Bahia Inglesia, stopping to take some photos of a typical highway-side memorial--amazingly elaborate--on the road to Bahia Inglesia right near the intersection with the main highway. 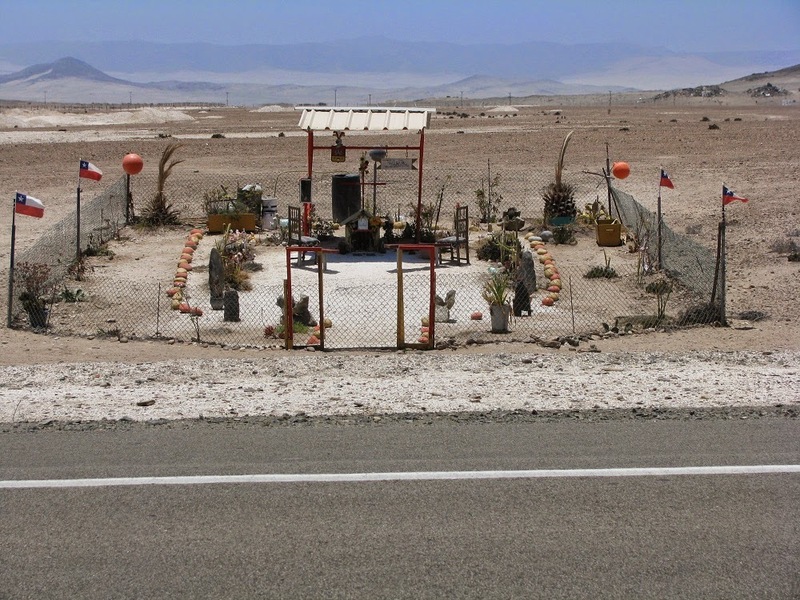 Memorials like this are common, scattered all along otherwise desolate stretches of highway. I got to the hotel at 2:20 and checked in quickly. The room I have this time is the one between the two I had before. It’s bigger and nicer than both. It also has the advantage of being able to drive practically up to the door, so I was able to empty the mess in the car with little hassle. 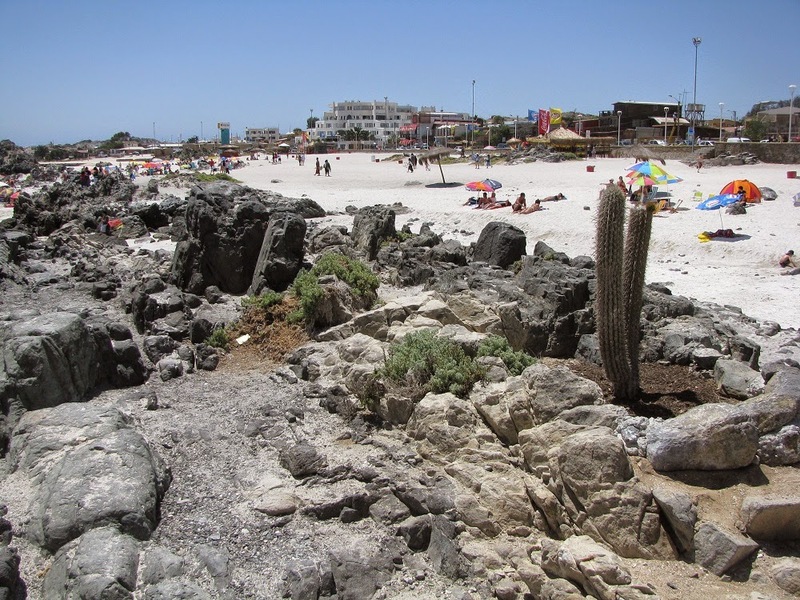 Then I put on sunscreen and walked the beach front walk and took pictures and looked for souvenirs and gifts. … nothing of much interest. Really, this is a very small resort town so the shops are quite limited. I returned to my room and ate one of the three canned herring specialty meat items I bought at Jumbo--super good! I also drank some of the apple juice I bought--first tried on the LAN flight, I find Chilean apple juice to be more like cider and really super delicious compared to the clear brown American version. I got out my laptop and found a decent wifi signal at the pool beside the restaurant so I got an outside table by the pool where there was an outlet. I hit about a dozen pages before it seemed to stall out completely. I managed to check my main emails and the CNN news page with news of a huge earthquake in Haiti. Otherwise I used the stall time to catch up on journal writing. The internet was still stalled, soI gave up and went back to my room for a while. (It was getting chilly outside in the shade by the pool anyhow). I ate another of the three herring tins--this was the biggest--smoked herring swimming in lots of vegetable oil. That seemed to assuage my craving for protein and fat. Then I took a shower and shaved. It was good to get rid of the stubble, but otherwise I didn’t really notice any difference being clean. Anyhow, I was out of the shower at 5:45 then I drank lots more of that apple juice (should have bought even more) and got back to the laptop and downloaded and processed the photos taken today. I finished all the liter box of apple juice while transferring all the images not yet posted on Facebook to my flash drive. If I can’t get to the internet with my laptop I’ll use the computer in the lobby. I ate a bit of the salami I bought--plastic skin that won’t come off without taking half the meat--and then decided to try the internet. It was putting stuff through pretty well, and with some patience I managed to upload all the photos! It wasn’t until 9PM that I got all the pics uploaded (about 40 of them) and captions written. Now it was time to pack. I took a break and went out to the local store and bought a bottle of water--guess I'm more dehydrated than I realized. I finished packing and ate a bit more of the greasy salami then went to bed at 11:20PM. Rest Day at Aguas Calientes, 13,500 ft.